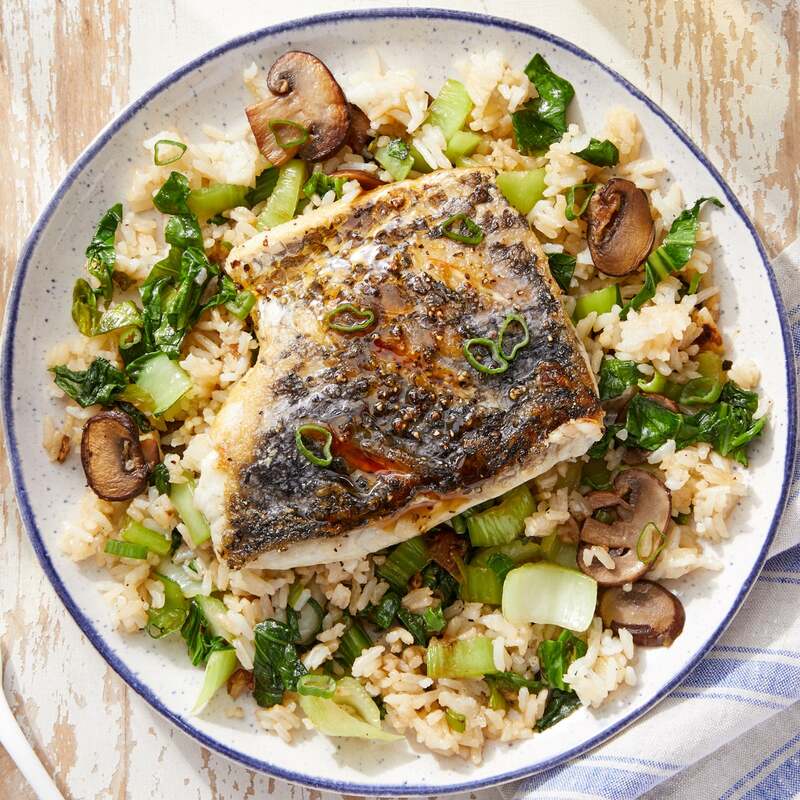 This adaptation of fried rice, a Chinese takeout classic, features a sauce made from fresh navel orange and soy glaze, which gives a quick boost of sweet and savory flavor to crispy-skinned barramundi. Remove the ghee from the refrigerator to bring to room temperature. 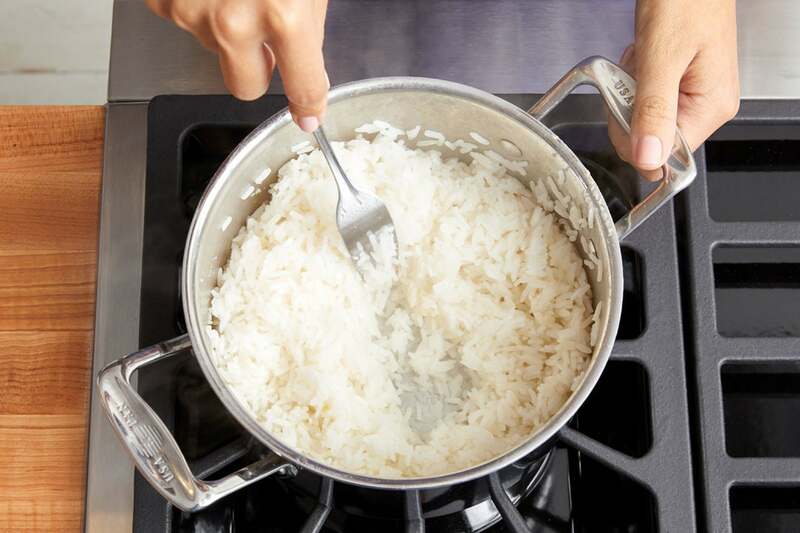 In a medium pot, combine the rice, a big pinch of salt, and 2 cups of water. Heat to boiling on high. Once boiling, reduce the heat to low. Cover and cook, without stirring, 12 to 14 minutes, or until the water has been absorbed and the rice is tender. Turn off the heat and fluff with a fork. While the rice cooks, wash and dry the fresh produce. Thinly slice the mushrooms. Peel and roughly chop 2 cloves of garlic. Thinly slice the scallions, separating the white bottoms and hollow green tops. Cut off and discard the root end of the bok choy; thinly slice crosswise. Halve the orange crosswise; squeeze the juice into a bowl. While the rice continues to cook, in a large pan (nonstick, if you have one), heat 1 tablespoon of olive oil on medium-high until hot. Add the sliced mushrooms; season with salt and pepper. Cook, stirring occasionally, 3 to 4 minutes, or until lightly browned. Add the chopped garlic and sliced white bottoms of the scallions; season with salt and pepper. Cook, stirring frequently, 1 to 2 minutes, or until slightly softened. 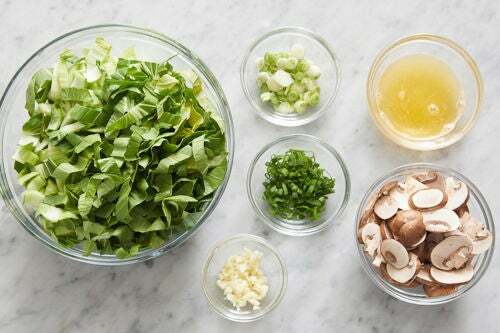 Add the sliced bok choy; season with salt and pepper. Cook, stirring frequently, 1 to 2 minutes, or until softened. Transfer to a large bowl. Wipe out the pan. In the same pan, heat the ghee on medium-high until melted. 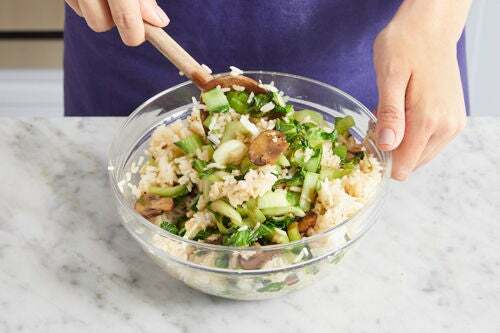 Add the cooked rice in an even layer. Cook, without stirring, 3 to 4 minutes, or until slightly crispy. Turn off the heat and carefully stir in half the soy glaze. Transfer to the bowl of cooked vegetables; stir to combine. Taste, then season with salt and pepper if desired. Cover with foil to keep warm. Wipe out the pan. 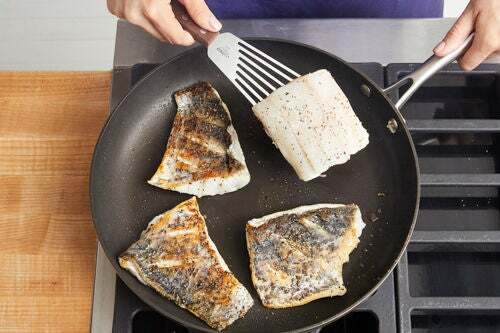 Pat the fish dry with paper towels; season with salt and pepper on both sides. In the same pan, heat 2 teaspoons of olive oil on medium-high until hot. Add the seasoned fish, skin side down, and cook 4 to 5 minutes, or until the skin is lightly browned and crispy. Flip and cook 2 to 3 minutes, or until lightly browned and cooked through. 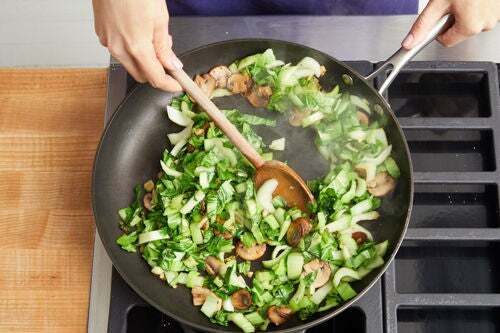 Leaving any browned bits (or fond) in the pan, transfer to a plate. To the pan of reserved fond, add the orange juice (carefully, as the liquid may splatter) and remaining soy glaze; season with salt and pepper. Cook on medium-high, stirring constantly and scraping up any fond, 30 seconds to 1 minute, or until slightly thickened. Turn off the heat. Taste, then season with salt and pepper if desired. 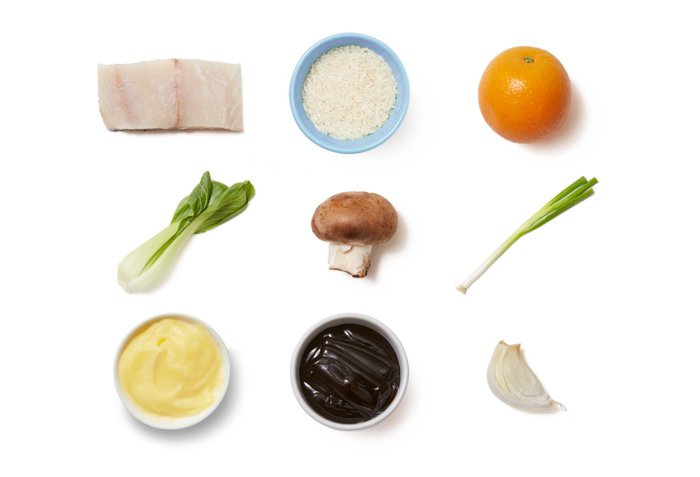 Serve the cooked fish over the finished rice. Top the fish with the sauce. Garnish with the sliced green tops of the scallions. Enjoy!